I had made this dip back in February for a Super Bowl party (YAY RAVENS! ), but I certainly think it is fabulous for any sort of entertaining/ large gathering event you may come across. I am labeling this as a “sinner meal” even in spite of lightening it up from my friend’s original recipe on her blog, Table for Two. Reason being that I think it is good to be real with yourself that lighter does not mean light. 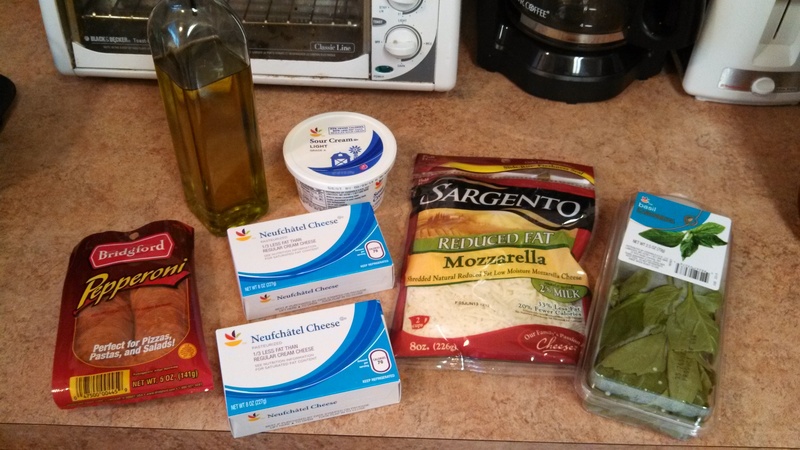 Cheese and pepperoni are certainly amongst ingredients you want to be moderate with in your diet. So make this, eat it, and enjoy it- all while remembering that moderation guiding principle! Shout out to Table for Two one of many doozy recipes. I’m certain your palette will be pleased! 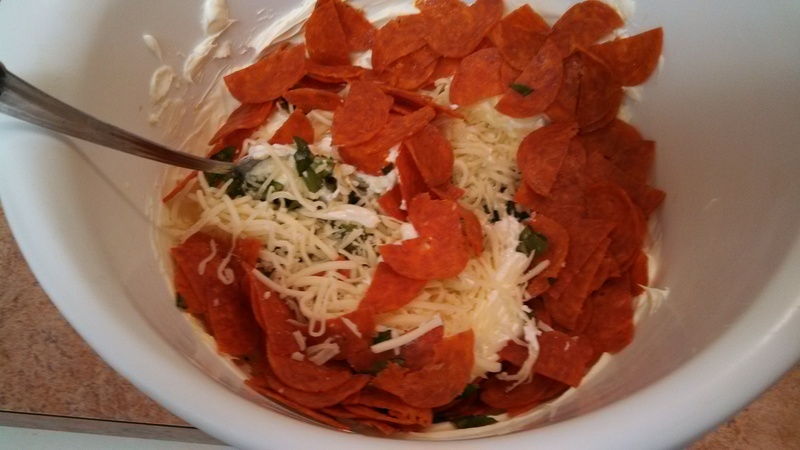 In a large bowl, combine cream cheese, sour cream (or greek yogurt), mozzarella, pepperoni, basil, and olive oil. Spread mixture in a rectangular casserole dish and smooth out the top using a spoon. Cover the top with more mozzarella cheese. Arrange whole pepperoni rounds on top of the mozzarella. Bake for 25 minutes, or until mixture is bubbly and cheese is good and melty. Serve hot with tortilla chips or sliced bread. Be cautious not to burn your mouth! This is the spread that threatened my waist line a few weekends ago. From snickerdoodles to s’mores bars, maple frosted pumpkin white chocolate chip cookies to Buckeyes, and coconut ganache bourbon balls to Oreo truffles, this holiday cookie exchange sent every lady home with a smile. In addition, we all left with a full tupperware (or two) of assorted cookies and a serious sugar high. This was a fantastic get together during the holiday season so think about hosting one next year like my fabulous friend Emily decided to. The jist? All of the participants bake around 2 dozen cookies/ dessert bars or so and comes equipped with extra tupperware. Then, everyone introduces their respective cookie and you around the table grabbing a cookie at a time until the table was cleared out. Genious! My contribution included holiday Oreo truffles and no-bake jumbled cookies. Both recipes are simple, yet crowd-pleasing. The Oreo truffles seem like a fancy chef made them. I can guarantee you’ll love them! The jumbled cookies came into my life courtesy of my former roomie, Lisa. So thankful we met (Lisa and I as well and me and the cookies!) Let’s take a look at the how-to’s. In a food processor or blend, process the whole package of oreo cookies. This works best if you break the cookies up a bit and process in waves. Add all of the cookies crumbles back into food processor or blender and add cream cheese. Blend well. Roll the truffle into around 1 inch balls. Microwave your white chocolate as directed and immediately begin dipping the balls into the chocolate to coat and transferring each to the baking sheet sprinkling each chocolate-coated truffle with the peppermint candy and some green sprinkles/sugar if you have it. Refrigerate at least 30 minutes to allow white chocolate shell to harden. Line a baking sheet with aluminum foil. In a large bowl, combine Rice Krispies and marshmallows. Set aside. In a double boiler or a DIY make-shift one, melt entire bag of white chocolate chips until creamy and smooth. Remove from heat. Stir peanut butter into the melted white chocolate until well-blended. Add the white chocolate and PB combo into the bowl of Rice Krispies and marshmallows and stir until all is well-coated. Allow to cool for about 20 minutes and then add your chocolate chips. You want to avoid the chocolate chips melting and streaking so the cooling period prevents that. Drop ice cream scoop or large spoonfuls of the cookie on the aluminum foil. Refrigerate for at least 10 minutes. Al’s Italian Beef: Al’s is one of the top 10 sandwiches in America and consistently ranked the #1 Italian Beef franchise in the Chicagoland area. I got my Italian Beef sandwich with homemade “HOT” Giardiniera (pronounced JAR – DIH – NAIR- AH) and provolone cheese, dipped. Giardiniera is basically a spicy and tangy, pickled pepper and jalapeno topping. I was not sure if I’d like it, but in retrospect I could not imagine having gone without it. Additionally, if you request that the sandwich be dipped, they give your whole sandwich a quick bath in the Giardiniera gravy. Again, I was not sure about this wet sandwich concept, but it was fabulous ultimately. Taco Joint: So you had a yummy Italian Beef sammy for lunch then you hit the Lincoln Park Zoo (photo of me there above). Viewing all those lions and tigers and bears (oh my) works up the appetite. Yet it is going to be several hours before dinner so something light is in order. Enter stumbling on a great little taqueria offering great tacos all paired with hand-made tortillas and home-made salsa for a $3-4/ each price point. Sold. The Al Pastor (Marinated grilled chicken breast garnished with Serrano-pineapple pico and tangy tomatillo salsa) and the Camaron (Grilled chile and garlic spiked shrimp garnished with avocado salsa and crispy flash fried spinach) fit the bill. I’m so happy we spotted this place! Lou Malnati’s: Of course you don’t visit Chicago and not eat deep dish pizza. Lou Malnati’s blew my first Chicago deep dish pizza experience out of the water. To be fair, I don’t like think the pizza from Gino’s East was bad. I simply think that getting meat lovers was too much. Additionally, Lou Malnati’s offers a more chunky tomato sauce and their signature Buttercrust™. Soooo good! 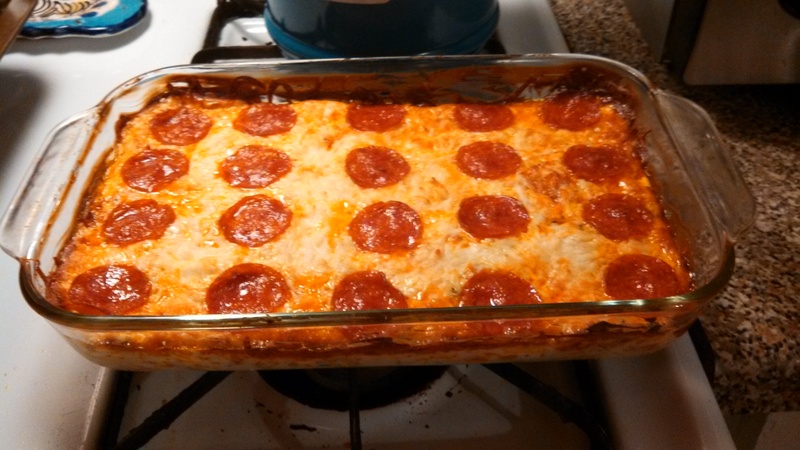 We went with a cheese deep dish and added pepperoni and mushroom. I cannot speak for more than two Chicago deep dish pizza spots, but I can say you won’t regret eating here if you choose Lou Malnati’s while in Chicago. Rockit Bar & Grill: The Baltimore Ravens were playing Sunday during our trip. B naturally had to find a spot to catch the game. Our friend, Quinlan, had suggested this sports bar which happened to be close to our hotel. The food looked pretty on point per the menu so the choice was easy. I am not a person who thinks about burgers much. I don’t crave them and sometimes when I do have them I am still really neutral. Not at this spot. I chose the Locavore Burger made of local beef raised in the midwest, goose island beer battered onion rings,nordic creamery smoked cheese, and nueske bacon aioli atop a pretzel bun. I got sweet potato fries with brown sugar salt and chipotle mayo for dipping. SO FAT. So satisfying. This meal induced a genuine food coma. 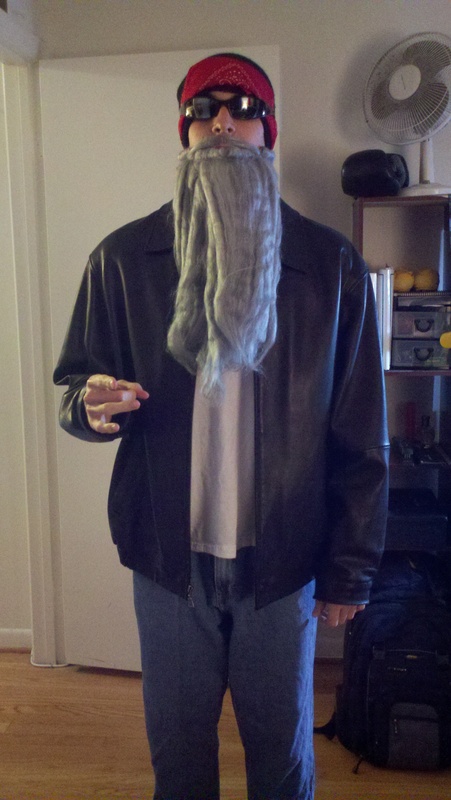 My motor functions were honestly feeling limited. Hash House a Go Go: Our final doozy meal in Chi-town. We stuffed ourselves with this same meal less the espresso drink during our Vegas adventures. However, the Chicago location did it better! Below you’ll see the Brown Sugar Banana Flapjack and one of their signature hash dishes including chorizo sausage, tomato, jalapeno, and cheddar paired with breakfast potatoes and two overeasy eggs. The brown sugar in the pancake was carmelized and the bananas in the pancakes were done better than at Hash House a Go Go’s sister Vegas location. I’m not sure how. I just know this was even more delicious than I remembered it being in Vegas. We shared this massive S’Mores Mocha which was a chocolatey latte graham crackers and fluff that was carmelized with a blow torch. This is a meal that holds you for many, many…many, many, many hours. Wow. I hope I’ve convinced you on the delicious adventures that await you in Chicago! Have a good week to all. 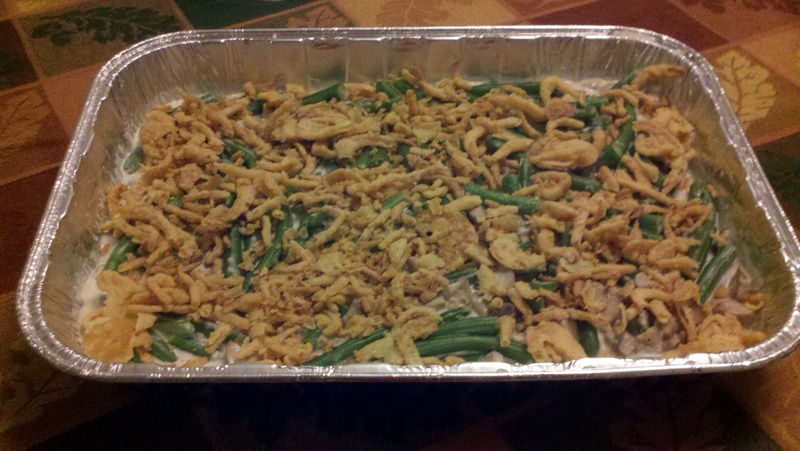 Adapted from Food Network’s version, I contributed this Green Bean Casserole to my family’s Thanksgiving spread. I’ve made this casserole a few times now and it has been equally tasty each time. 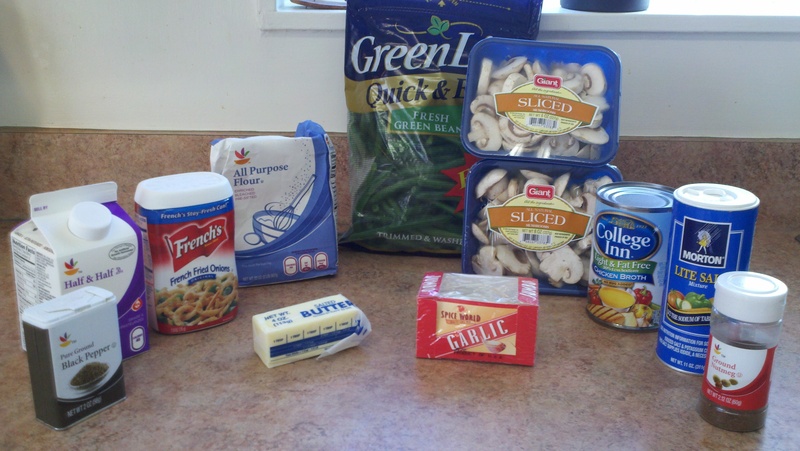 While I am pro making my own cream of mushroom soup for the dish, I am okay with cutting corners with the topping. I use a container of French’s French Fried Onions instead. I find them to be absolutely delicious although not the healthier of topping options thus my not designating this as a saint meal option. 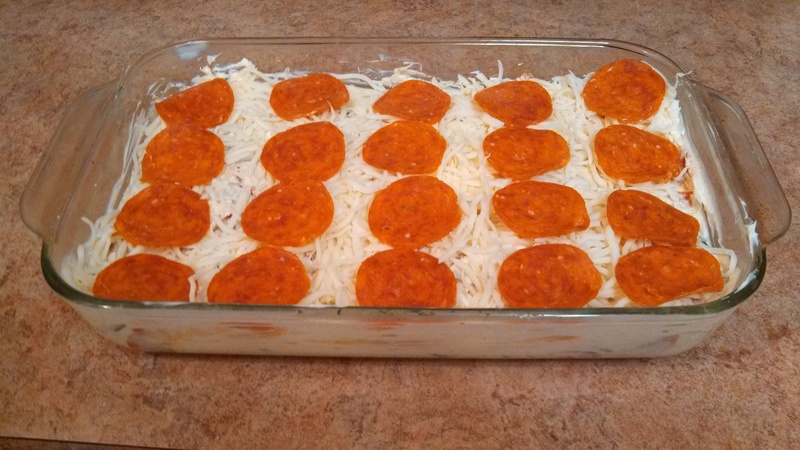 I’ll give a homemade topping a try someday (there are several great options I’ve seen out there), but I’ve had no complaints with this method so far from the groups I’ve made it for. My family actually requested it make another appearance in the menu lineup for this year’s Christmas dinner! Bryan liked it so much that we’ve discussed cutting the recipe in half and having as a side to every day type meals. You don’t have to wait for a special occasion either 😉 Have a great week- if you’re like me settling back into the work grind will be tough so I wish you the best of luck. Eat some delicious things to make it easier maybe?! To prepare the beans, bring a gallon of water and 2 tablespoons of salt to a boil in an 8-quart saucepan. Add the beans and blanch for 5 minutes. 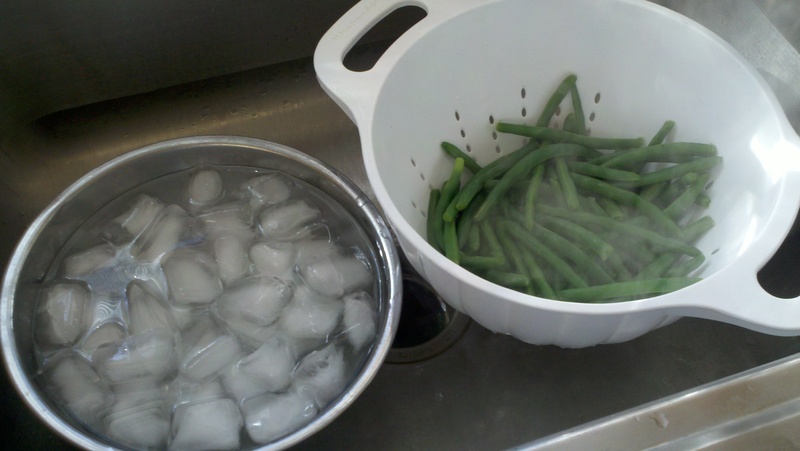 Drain in a colander and immediately plunge the beans into a large bowl of ice water to stop the cooking. Drain and set aside. Melt the butter in a 12-inch cast iron skillet set over medium-high heat. 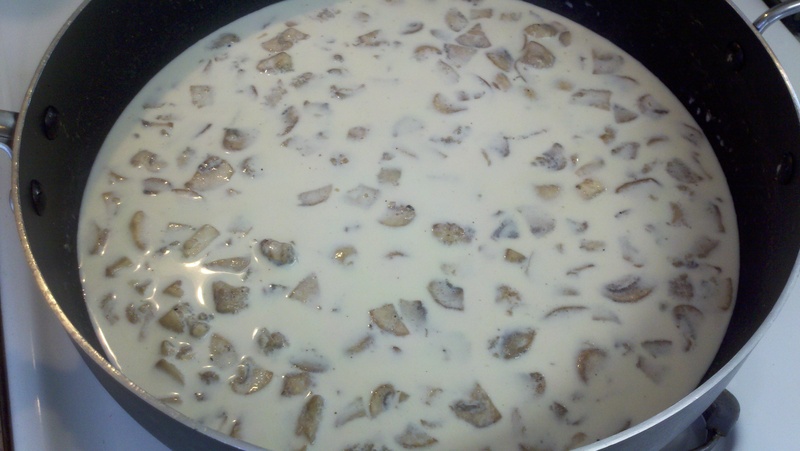 Add the mushrooms, 1 teaspoon salt and pepper and cook, stirring occasionally, until the mushrooms begin to give up some of their liquid, approximately 4 to 5 minutes. Add the garlic and nutmeg and continue to cook for another 1 to 2 minutes. Sprinkle the flour over the mixture and stir to combine. Cook for 1 minute. Add the broth and simmer for 1 minute. Decrease the heat to medium-low and add the half-and-half. Cook until the mixture thickens, stirring occasionally, approximately 6 to 8 minutes. Remove from the heat and stir in all of the green beans. Top with the onions. Place into the oven and bake until bubbly, approximately 15 minutes. Remove and serve immediately. Having a few days at home due to Hurricane Sandy closing the federal government led to more opportunities to cook things. I had planned to bake a brownie-based baked good for Bryan and then make it fabulously Halloween-themed. I did some perusing on Pinterest and Google and arrived at Graveyard Brownies being THE one. There were a bunch of versions so I simply pulled from several to end up with exactly what I wanted although some people poked fun at my “grass” (green-tinted coconut flakes) layout being illogical (Yeah, Mike I’m talking to you). I grabbed the most fudge-laden brownie mix box possible, followed those directions, leaving most of the work to decorating scene. 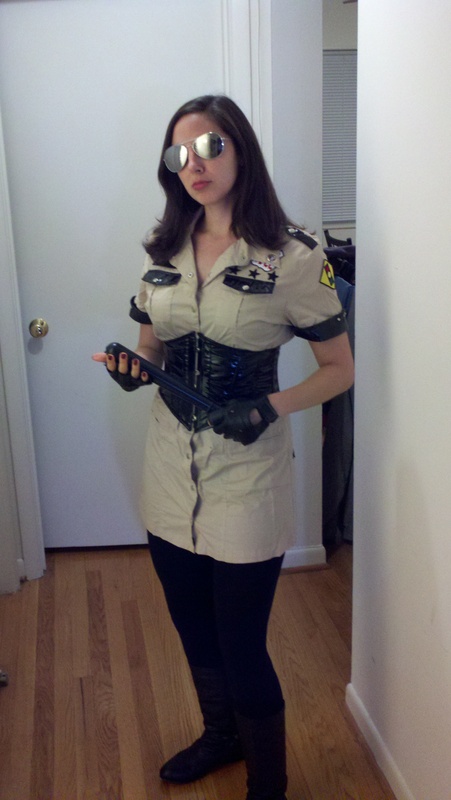 Overall, I was thrilled how it turned out. The only lessons learned were changing up the “grass” layout and buying a thicker/more substantial cookie. The Pepperidge Farm Bordeaux cookies had the texture and squared off shape that I wanted for the tombstones, but they were too thin and eventually toppled over from, I suspect, the moisture of the brownies. Milanos would likely fare better. I hope you’ll make something like this next year! 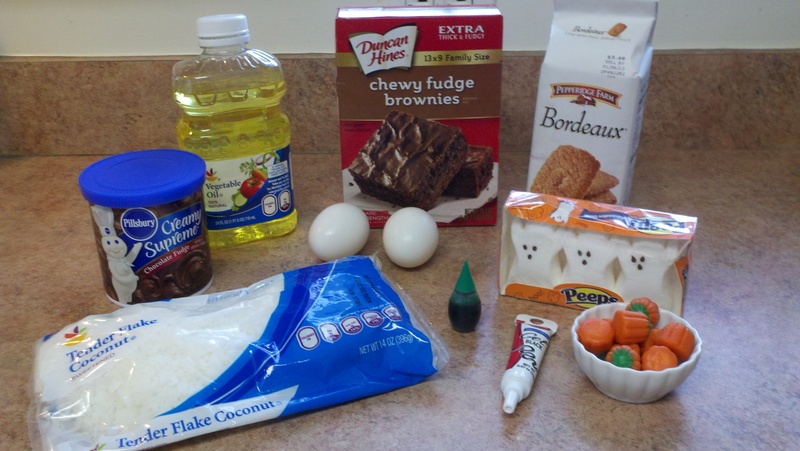 Follow directions on brownie mix box, baking in a 9 x 13. Let cool 15 minutes before icing the whole pan. Tint about 1/2- 1 cup coconut flakes with a few drops of green food coloring and stir well. Crush cookies in a ziplock bag. Write RIP on one side of the top of your cookies. 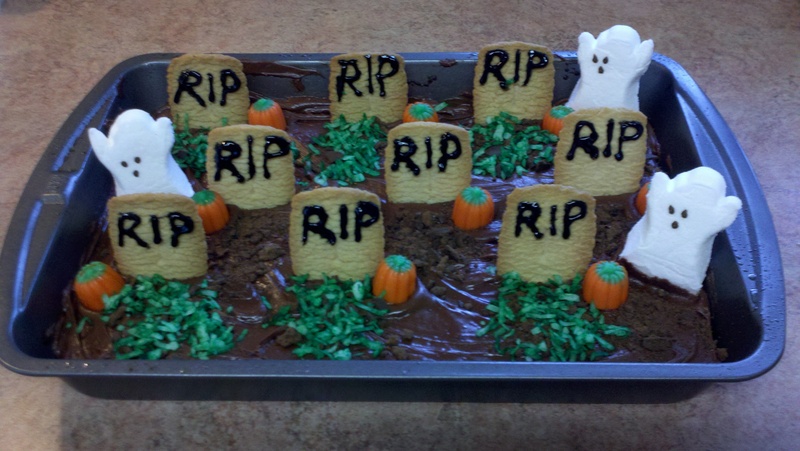 Decorate your pan of brownies like a graveyard! All staff at each restaurant are ready to throw you in a seat assumptively calling out, “Table for two?” as you walk by and practically sitting you in a seat. We had one particular waiter who still subscribed to this method, but caught Bryan’s attention with recognizing his Baltimore Ravens jacket and striking up football convo. Next thing you know we’re seated and perusing the menu. Our dish selections included Gnocchi with red sauce and melted mozzarella across the WHOLE top and a Penne alla Vodka. Both were great but man I hadn’t had vodka sauce that good in a long time. Blew my mind. Nothing could end a meal like that better than an Italian treat. Chocolate covered cannolis seemed only fitting. We planned to eat lunch at Eataly, a big Italian marketplace, however the wait time was too extensive for our rumbling stomachs. We stumbled upon a gem right next to Eataly called Madison Square Eats. Think food trucks but permanent location and more like a tented booth than a truck. Every type of food possible was available- pizza, BBQ, Mexican, various Asian cuisine, treats, and more. We started with some pizza to whet the appetite. Pretty decent and reasonable price at $8. Next, we checked out Mighty Balls. This spot offered beef, pork, and turkey meatballs and a number of sauce options. You could get mini sliders or “just the balls.” I was for the balls only. (If you giggled, you’re a child…I may have giggled writing it). I got a pork meatball with a jalapeno jelly, a turkey meatball with cranberry horseradish and goat cheese, and a beef meatball with a brown gravy-like sauce and mozzarella cheese. My fav was a toss up between the turkey and the pork meatball. It was so unique! 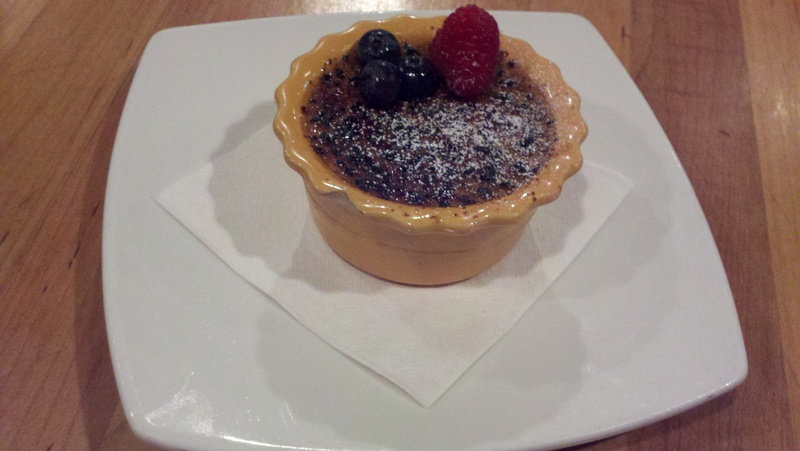 The sweet item was shared like our app and it was a non-negotiable. There was a guy who’s mom is from Liege, Belgium who had a Belgian waffle stand. Once he told me about mom, I knew it was going to be legit. We took a waffle and smothered it in warm Nutella, Spekuloos spread (like graham cracker and gingerbread to me), strawberries, and whipped cream. Pure bliss! Good thing we had places to walk to after this meal. Carnegie Deli is a popular spot not far from Times Square. Following seeing Chicago (which was a fun show), we went for a late dinner to Carnegie. They are known for massive sandwiches and yummy corned beef. We got a behemoth of a Reuben…this darn sandwich was like $35 with tax and tip. Crazy right? Now the sandwich was tasty, but I will say in a Reuben I like balance. Give me lots of the corned beef but don’t skimp on sauerkraut either. We had to request some more of the latter to find that balance. Hope these are some spots you might include on your next NYC trip. What do you love to eat while visiting the Big Apple? We decided we wanted to do a few starters, split a big entree, and a treat. It was a really cool experience watching the chefs prepare all of our dishes fresh and right before our eyes. Yes, food is prepared in front of you at say a Japanese steakhouse, but it was something different because it almost felt individualized. 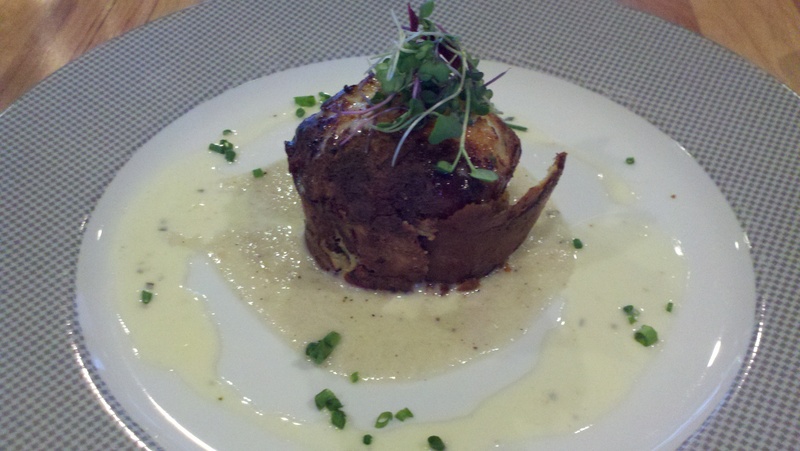 We started with the Harvest Corn Chowder as well as the Lobster Bread Pudding (pictured below). 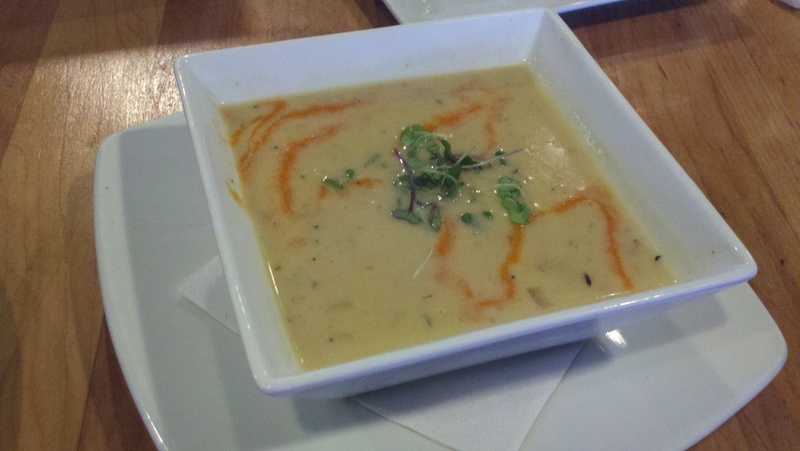 The chowder was far better than the Lobster Bread Pudding despite our high hopes given the appeal of the lobster. I guess a soup with bit of bacon in it is going to be hard to mess up, but the bread pudding was a whole lot of bread and not too much lobster. This was particularly disappointing given the $16 price tag for the 2-3 bites each we had. You live, you learn. 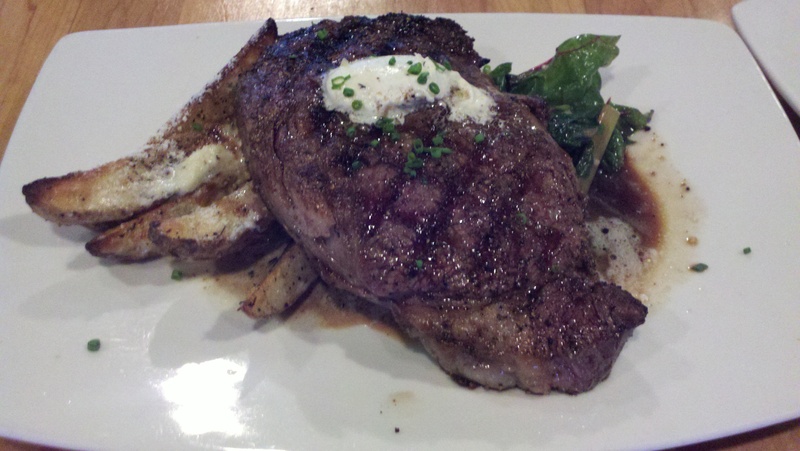 The mouth-watering steak and fries pictured at the beginning of this post reflect the 16 oz. 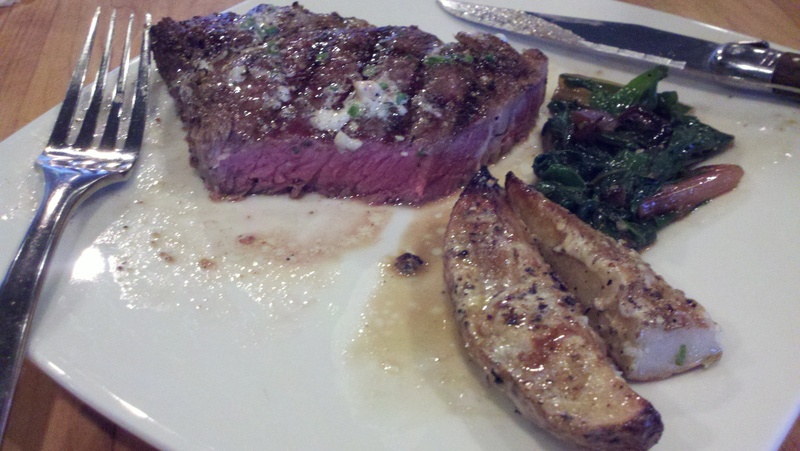 Ribeye steak cooked to absolute perfection with parmesan fries. I mean look at the inside of this- we requested medium and OMG was it ever succulent. And you can’t eat all this without finishing it off with a little something sweet. The Dark Brown Sugar Vanilla Creme Brulee answered the mail to that end (pun intended). The rest of the meal more than made up for the Lobster Bread Pudding disappointment- almost enough to feel like it didn’t happen. Although of course there it was on the tab to remind us ha. 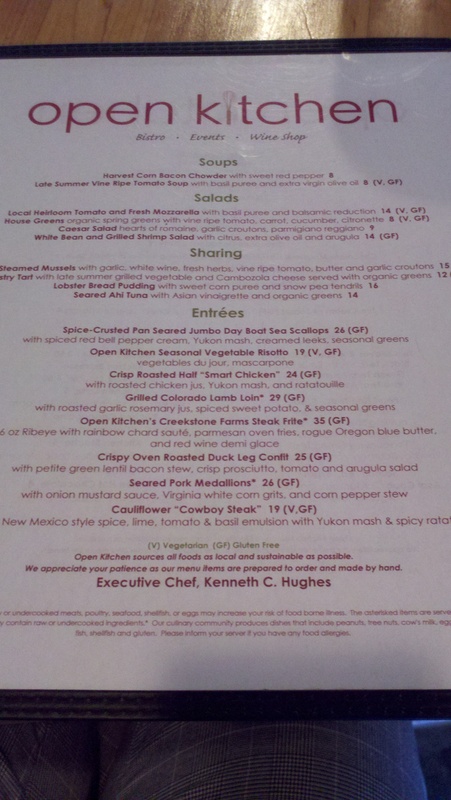 Go check out Open Kitchen and try some of the dishes I have recommended. Oh and one last thing, let me know if the chefs seem super adamant about food runners. A pretty hilarious part of the dining experience was that if two or three dishes were up on the bar to be served, the head chef would get slightly agitated and yell RUNNERS! We probably heard that word 15 times across the duration of our meal. I’ve randomly thought of it since and it makes me giggle. Have a great start to your week! Like What You Read Here? Follow Me!